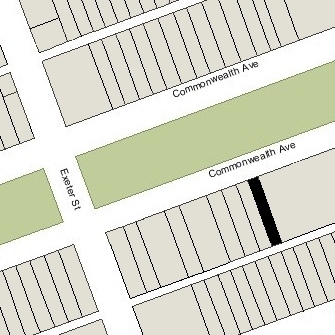 172 Commonwealth is located on the south side of Commonwealth, between Dartmouth and Exeter, with 160 Commonwealth to the east and 174 Commonwealth to the west. 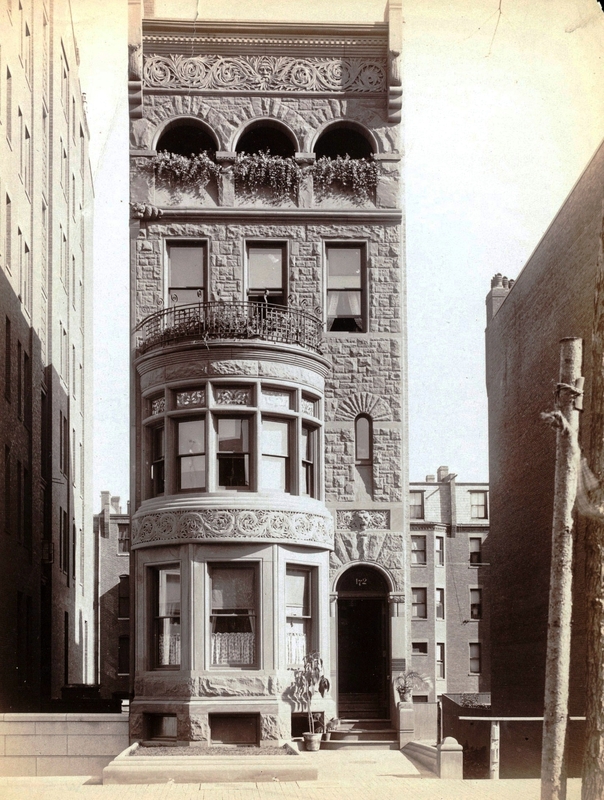 172 Commonwealth was designed by architect John H. Besarick and built in 1885-1886 by L. R. Soule and Whitney Brothers, builders, as the home and medical office of Dr. Charles Samuel Bartlett, a dentist, and his wife, Annie Maria (Brazer) Bartlett. He is shown as the owner on the original building permit application, dated July 2, 1885, and on the final building inspection report, dated July 16, 1886. 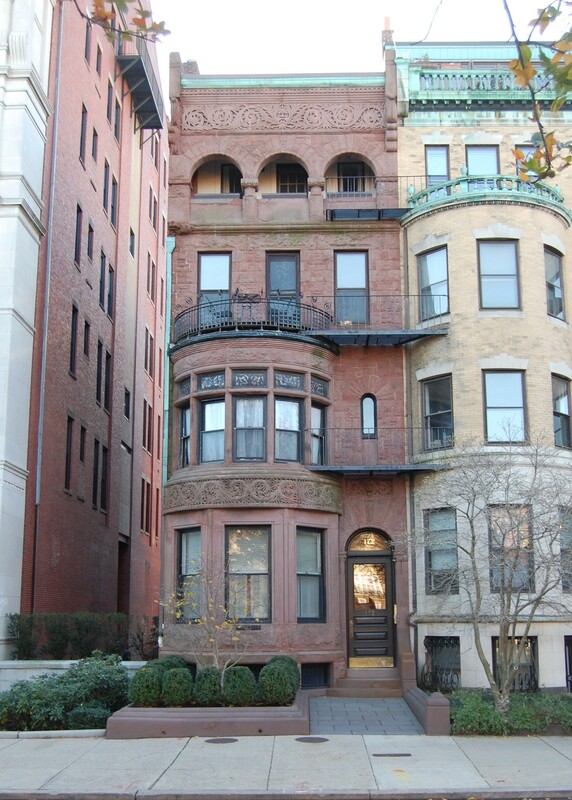 In 1885, the Bartletts had lived (and he had maintained his medical offices) at 142 Boylston. It previously had been the office and Boston home of his father, Samuel P. Bartlett, also a dentist, who died in April of 1884. Annie Maria Bartlett purchased the land for 172 Commonwealth on May 6, 1885, from Charles Whitney, owner of the Hotel Vendôme. The deed included language limiting the height and depth of any building erected at 172 Commonwealth so that it would not adversely affect the hotel. It also established an easement for light and air over the 13.5 foot wide open lot between the two properties, but specified that the owner of the hotel had the right to build on the lot at his discretion. The deed also included language specifying that the owner of the Hotel Vendôme had the right to maintain the property “as now built,” thereby preventing the owners of 172 Commonwealth from challenging whether the hotel complied with the deed restrictions contained in the original land deeds from the Commonwealth. The lot for 172 Commonwealth was part of a larger parcel which included the 13.5 foot lot to the east, between 172 Commonwealth and the Hotel Vendôme, and the lot to the west where 174 Commonwealth would be built. Charles Whitney had purchased the parcel on June 27, 1883, from William T. Hart, who had purchased it from the Commonwealth of Massachusetts on April 7, 1874. Click here for an index to the deeds for 172 Commonwealth. By 1888, Charles and Annie Bartlett had been joined at 172 Commonwealth by Dr. Henry Cutler Baldwin, a neurologist, who both lived and maintained his medical office there. He previously had been traveling abroad. He continued to live at 172 Commonwealth until 1892, when he moved to 126 Commonwealth. Also from about 1888, Dr. Julius Georg Wilhelm Werner maintained his dental office at 172 Commonwealth. He and his wife, Ada L. (Wallace) Werner, lived in Brookline. From about 1894, Dr. Samuel Breck, a physician, also maintained his office at 172 Commonwealth with Dr. Bartlett and Dr. Werner. He and his wife, Louisa Maria (Eddy) Breck, lived in West Roxbury. In 1893, they had lived (and he had maintained his offices) at 122 Marlborough. He continued to maintain his offices at 172 Commonwealth in 1898, but had moved to 362 Commonwealth by 1900. Charles and Annie Bartlett continued to live at 172 Commonwealth until about 1902, when they moved to an apartment at 366 Commonwealth. On June 23, 1902, 172 Commonwealth was purchased from Annie Maria Bartlett by Sarah (Sally) (Hecht) Ehrlich, the wife of Dr. Henry Ehrlich, a physician. He also maintained his medical offices in the house. They previously had lived and he had maintained his medical office at 553 Columbus. Dr. Bartlett and Dr. Werner also continued to maintain their dental offices at 172 Commonwealth, Dr. Bartlett until about 1912 and Dr. Werner until about 1916. Henry Ehrlich died in February of 1926. 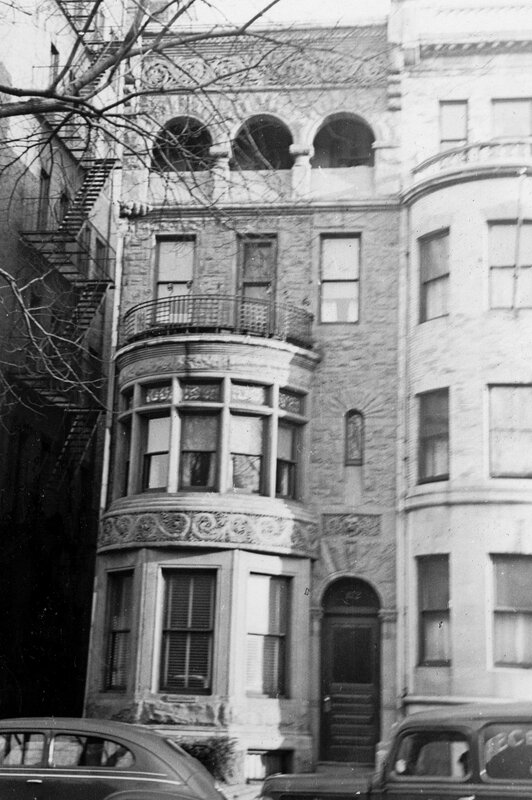 Sally Ehrlich continued to live at 172 Commonwealth until about 1931. She also maintained a home in Clifton, Massachusetts. On August 15, 1931, 172 Commonwealth was purchased from Sally Ehrlich by real estate dealer Joseph P. Brennan. On November 4, 1932, she foreclosed on Joseph Brennan’s mortgage and took back possession of the property. 172 Commonwealth was not listed in the 1932-1937 Blue Books, nor in the 1932-1935 Lists of Residents, and was shown as vacant in the 1932-1935 City Directories. In 1936, 172 Commonwealth became the home and medical office of Dr. Eugene Todhunter Vincent, a physician and dentist. He previously had lived in Cambridge with his wife, Mabel Amanda (Short) Vincent. They separated in March of 1936 and she continued to live in Cambridge. By 1937, Eugene Vincent had been joined at 172 Commonwealth by his sister, Mrs. Eleanor Bertha (Vincent) Murray, the former wife of George Lawrence Murray, and their son, George Edwin Murray, a chemist. They all moved to 231 Commonwealth in 1938. 172 Commonwealth was once again shown as vacant in the 1938 City Directory. In October of 1938, real estate dealer Shirley Clifford Speed applied for (and subsequently received) permission to make repairs to 172 Commonwealth, and on December 29, 1938, he purchased the property from Sally Ehrlich. On January 7, 1939, 172 Commonwealth was purchased from S. Clifford Speed by John Bush Harvey. 172 Commonwealth became the home of Florence Harriet (Muir) Van Ness, widow of Dr. Ward Milton Van Ness, a dentist in Bridgeport, Connecticut. She operated it as a lodging house. She previously had lived at 122 Bowdoin. She continued to live at 172 Commonwealth in 1940 but moved soon thereafter to Northampton, where she remarried in November of 1942 to John Skinner, a retired cotton goods manufacturer. On July 20, 1945, 172 Commonwealth was purchased from John B. Harvey by Mrs. Alice W. Lauren. She lived at 59 Commonwealth, where she operated a lodging house. At the time of the transaction, John Harvey and his wife, Aileen (McDonald) Harvey, were residents of Enid, Oklahoma; Florence H. Skinner held their power of attorney and executed the deed. On March 1, 1946, 172 Commonwealth was acquired from Alice Lauren by Delillus (Crockett) Kipp, the wife of attorney Roy Frank Kipp, who continued to operate it as a lodging house. The Kipps owned and lived at 178 Commonwealth and also owned 174 Commonwealth. In November of 1957, they acquired 176 Commonwealth. They also owned 163 Commonwealth, across the street. In February of 1950, Delillus Kipp filed for (and subsequently received) permission to convert the property into nine apartments. 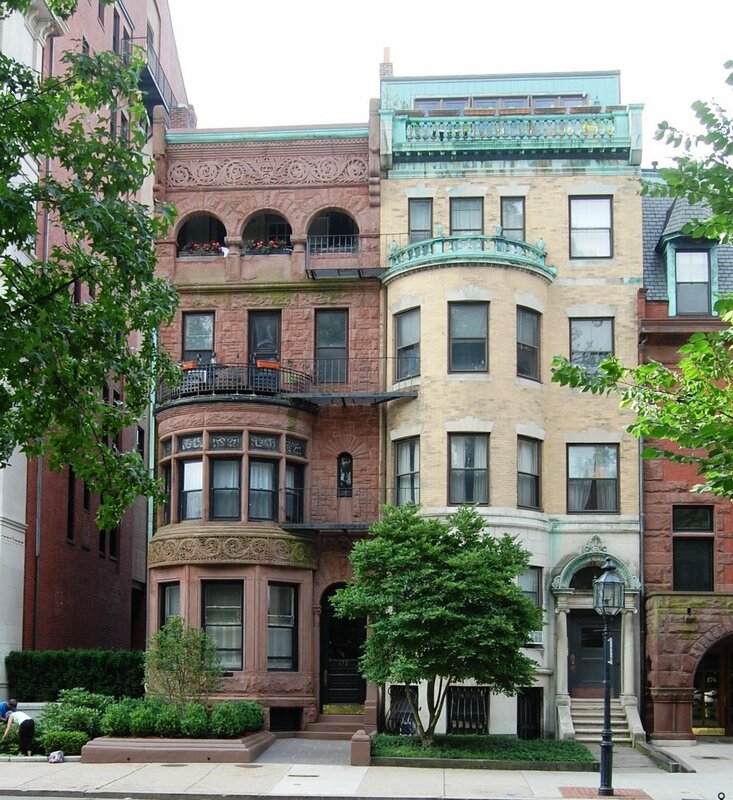 On April 20, 1988, 172 Commonwealth was purchased from Delillus Kipp by Eric D. Berke, trustee of the 172 Commonwealth Avenue Realty Trust. The property subsequently changed hands. It remained an apartment house in 2016.